Orchids love the fresh air (and humidity) growing outdoors. 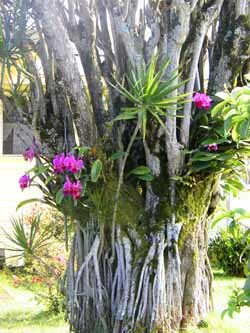 In many parts of the world, hobbyists grow their orchids outdoors year round. Why? Unfortunately, many of us are are "climate challenged" and growing outdoors year round simply isn't possible. Give Your Orchids a Vacation - Move Them Outdoors for Summer! Even if you're climate challenged you can still give your orchids a vacation by moving them outdoors for the summer! Summer weather is perfect for growing all types of orchids, no matter where you live. Plants that where struggling all winter might spring to life outdoors! The outdoor season is from mid-May to late September. Plants need time to acclimate to outdoor weather. Start with total shade outside for all plants. Then, gradually move the high light plants into more sun. Burn spots on the leaves can happen quickly. Think of your first day at the beach after a long winter. Know how much sun/shade your outdoor growing area gets throughout the day. The sun changes positions in the sky with each season. Before moving your orchids outdoors take the time to measure how much sun/shade your growing area gets throughout the day. You might be surprised! Don't worry about the heat. If your plants are protected from direct sun and get good air circulation, heat shouldn't be a problem. Grow on benches or tables, not on the ground. Protect your plants from creepy crawlers. Most people think hydroponics is only for indoor growing. Our hydroponic system has many advantages for outdoor growing too! The biggest feature is our system replaces all growing media with unique clay pebbles called LECA (Lightweight Expanded Clay Aggregate). Ordinary growing materials (like bark and moss) have problems outdoors because they deteriorate quickly when exposed to the weather. Decaying media compacts and traps water, cutting off air to the plant's roots. Decaying roots in bark and moss. 2. Easy watering - Watering can be a tricky business with traditional media outdoors. Ignore the elements and your plants will suffer. - Hot, dry weather means watering everyday with bark or moss. Plants growing in our system have an ample supply of water that is stored in a reservoir at the bottom of the grow pot. 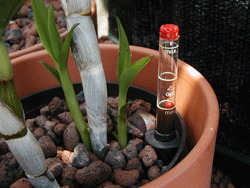 The LECA pebbles "wick" moisture up to the plant as needed. All you have to do is refill the reservoir when empty. - If the weather turns cool and rainy - be careful! Your plants will be waterlogged in bark or moss! 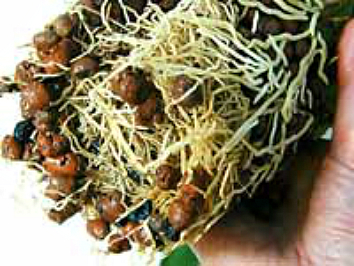 The LECA pebbles in our system never rot or decay, so the roots won't get waterlogged no matter how much rain you get. Plants practically take care of themselves growing in our hydroponic system outdoors! Follow our guidelines for setting up your orchids for "outside growing" and you'll never have to worry about watering again - even with a garden hose!